Philosophy Here and Now: Powerful Ideas in Everyday Life, Second Edition, is a hybrid text/reader that helps students understand, appreciate, and even do philosophy. The book emphasizes philosophical writing, reinforced with step-by-step coaching in how to write argumentative essays and supported by multiple opportunities to hone critical thinking. It shows students how philosophy applies to their own lives and brings the subject to life with engaging chapter-ending literary selections, abundant illustrations, and a wealth of pedagogical features. * Additional pedagogical elements make the material even more engaging and accessible. These include marginal critical-thinking questions, marginal quotes, a timeline, key terms (boldfaced at their first appearance and listed and defined at the end of each chapter), marginal definitions, and a glossary. 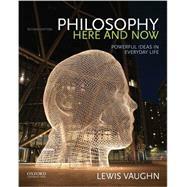 Lewis Vaughn is the author or coauthor of numerous books, including The Power of Critical Thinking, Fifth Edition, (2015), Living Philosophy: A Historical Introduction to Philosophical Ideas (2014), Philosophy: The Quest for Truth, Ninth Edition (2013), The Moral Life, Fifth Edition (2013), and Bioethics: Principles, Issues, and Cases (2012), all published by Oxford University Press. SWINBURNE: Is There a God? JAMES: "The Will to Believe"
SHAFER-LANDAU: Whatever Happened to Good and Evil? BAIER: "The Need for More Than Justice"
Fiction: Ursula K. Le Guin, "The Ones Who Walk Away from Omelas"
SMART: "Sensations and Brain Processes"
NAGEL: "What Is It Like to Be a Bat?" Fiction: Terry Bisson, "They're Made Out of Meat"
D'HOLBACH: "Of the System of Man's Free Agency"
JAMES: "The Dilemma of Determinism"
ROWE: "Two Concepts of Freedom"
SARTRE: "Existentialism Is a Humanism"
Fiction: Thomas D. Davis, "A Little Omniscience Goes a Long Way"
Fiction: Edgar Allan Poe, "The Oval Portrait"
BAGGINI: What's It All About? BAGGINI What's It All About? Fiction: Voltaire, "The Good Brahmin"